Robotics with the Boe-Bot Text. What's a Microcontroller? 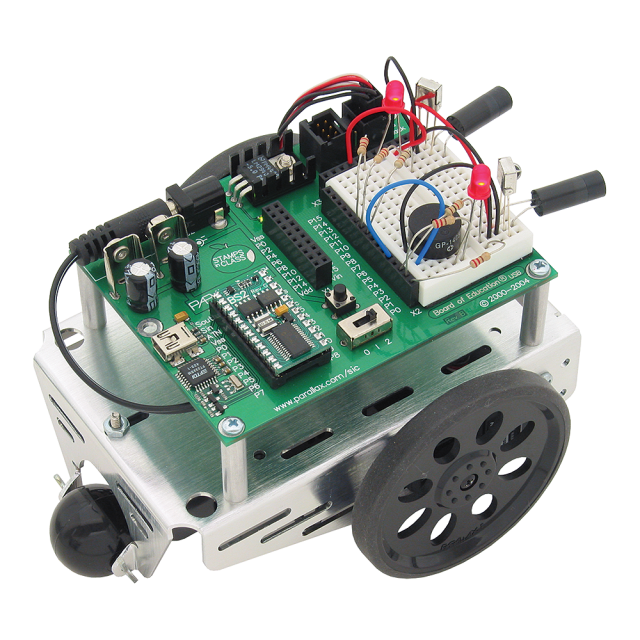 Activities with Boe-Bot Parts. Boe-Bot Light Sensors BS2 Example Code. Getting Started with Stamps in Class - Help excerpt. More Boe-Bot activities in the Stamps in Class Mini Projects. John Kauffman's Boe-Bot resources by a teacher, for teachers! 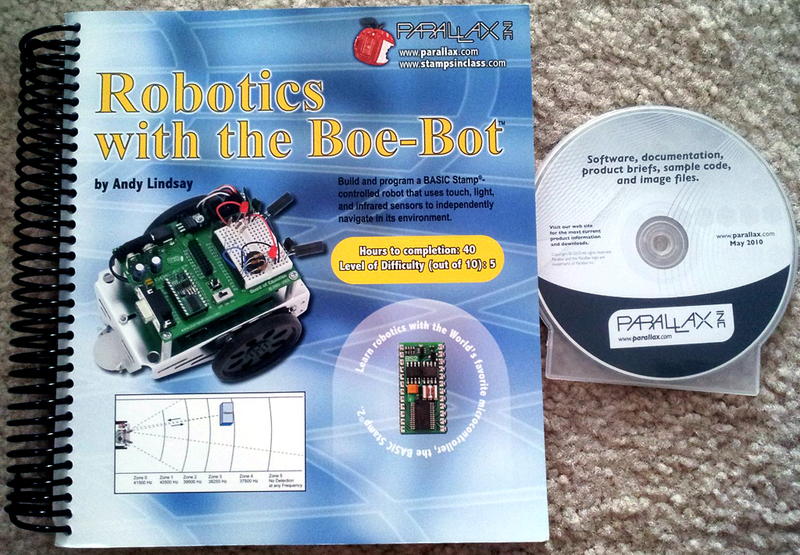 Interactive Media Publishing's Exploring Robotics multimedia curriculum featuring the Boe-Bot robot. Boy Scouts of America Robotics Merit Badge with the Boe-Bot. Boe-Bot videos from Sacramento State University. You can find Boe-Bot robots in middle and high schools, vocational schools and colleges, robotics clubs, and hobbyists’ homes. 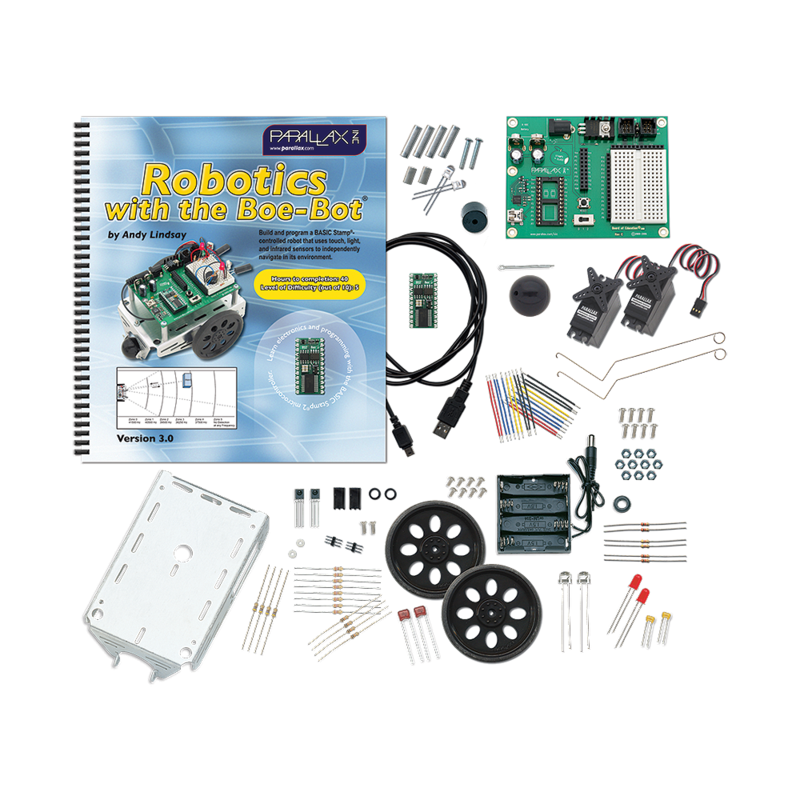 They are great companions for learning or teaching technology, mechatronics, and STEM programs. It's also an approved platform for the Boy Scouts of America Robotics Merit Badge. Beginner-friendly - No programming experience needed. Open platform - Exposed circuitry allows you to learn and create your own electronic circuits. Solder-free - Experiment with custom circuits on the breadboard (no special-brand connectors). Understandable - Included text provides easy-to-follow tutorials. Programmable - PBASIC is easy to learn and introduces concepts found in most programming languages. Autonomous - Touch, light and infrared sensors let the Boe-Bot navigate on its own. Expandable - Additional sensors and hardware expansion kits are available to get the most our of your robot. Board of Education development board with a BASIC Stamp 2 microcontroller. Durable brushed-aluminum chassis with mounting holes for servos and accessories. Parallax continuous rotation servos for the drive wheels. Sensors including whisker-switches, phototransistors, and infrared emitter/receiver pairs. LEDs and a piezospeaker for audio and visual feedback. All the resistors, capacitors, and jumper wires needed to build the circuits. All the screws, nuts, and other hardware needed to build the Boe-Bot. USB A to Mini-B cable to connect the Boe-Bot to your Windows computer for programming. NOTES: Requires 4 AA batteries, not included, and a PC running Windows XP/Vista/7. Recommended for ages 13 and up.